The Royal Academy's Summer Exhibition 2016 opened to the public today and I'm sure they had a lot of visitors. by artwork - these are listed in the order they are listed in the catalogue. You can review every single work in the exhibition. Each one has its own page. It also means that if you can't get an artwork out of your head you can go back and have another look when you get home before deciding whether or not to part with some cash. The major change of note for 2016 is that you can now BUY any print online by placing a deposit. This is the major change for 2016. Last year the artworks were available online - but you had to fill a form in and then enquire whether it was still available. I think I may have just found my answer as to why the sales were looking so very good on Friday when I visited at the first of the Friends Reviews. Oddly, the press release for the exhibition makes absolutely no reference to the ability to buy prints online so I don't know how many others covering the exhibition will have highlighted this new facility. I also can't find any reference to the new facility on the Facebook Page. Very odd! I think taking the entire exhibition online and making it both virtual and accessible to those who want to buy is a very clever decision. For the first time in 2015 we produced the Summer Exhibition Explorer – an online fully illustrated list of works. Nearly 120,000 users visited the website, many to check the availability of works for sale. 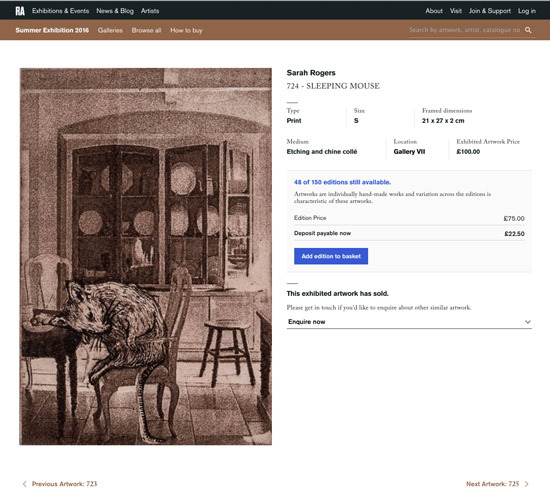 In fact it might well prompt others to think very hard about the fact that it's rapidly becoming a standard expectation that exhibitions are virtual as well as in a gallery - with artwork for sale. After all if ordinary artists without a gallery have been making sales online with just decent images and complete and full information about the artwork, why can't we expect the organisers of art competitions and open exhibitions do the same? Especially as most submissions are now digital! What I'm curious about is whether the RA uses the artist's digital image or whether they reshoot the artwork for the website. I'm not quite sure why anybody would photograph 1,240 artworks unless they had to. It does make me also think whether we are underestimating the importance of the quality of the digital image used for submission. Creating Virtual Exhibitions - and more sales! Doubtless it costs the RA more than a little to get the virtual website up and running. However they did it for the first time last year and it was more than a bit successful. 120,000 visitors is a lot of visitors and I'm sure they can grow that number once people become more aware that the virtual exhibition is available to view. Obviously the new facility has also revealed the scope to sell more art given that the majority of people who visited last year did so to check the availability of works for sale. It comes as no surprise therefore that this year the RA are making it even easier to generate more sales. It's interesting to see there is an Amazon like "if you like this then you might like this too" section seems to be biased towards the price range or the type of artwork rather than the nature of the artwork. My feeling is the "you might like this" ought to be have a much better fit with the artwork. However I guess that might be a monumental task - or maybe they just need to get much better and more refined at tagging artworks so the software can do it for them? While you still have to fill in a form if you want to buy an original painting, drawing or sculpture, the printmakers are rather more fortunate. If you're a printmaker I think I'd download this pdf statement for information re. next year's submission! As in previous years, the exhibitor is the seller of the work with the RA forwarding the ‘Offer to Purchase’. However, it should be noted, by offering to sell work online the exhibitor agrees to comply with the UK’s distance selling regulations. This means that when the exhibitor responds to the distance ‘Offer to Purchase’ they must inform the buyer of their fourteen-day right to cancel. Otherwise, the buyer is legally entitled to cancel their purchase and return the print for an additional 12 months. If you lose the website address you now know it's listed in this blog post. However the other place you can find it is on the Summer Exhibition Main Page where it says "Browse and buy art"